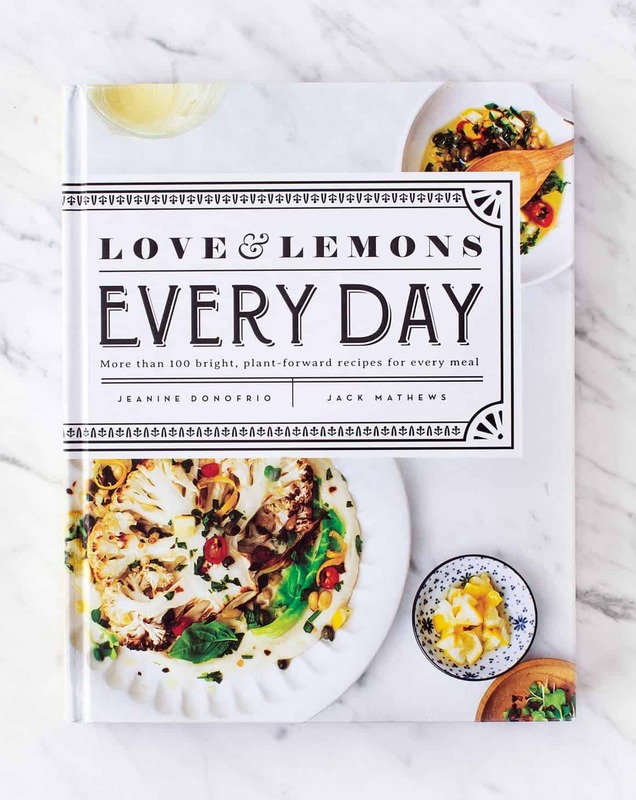 Our new cookbook, Love & Lemons Every Day, is coming out April 2nd! Here’s what’s in the book! Love & Lemons Every Day is the perfect book for making any meal, from breakfast to dessert, where vegetables (and/or fruits) are the star. Butternut squash becomes the best queso you’ve ever eaten, broccoli transforms into a zesty green “rice” burrito filling, and sweet potato blends into a smooth chocolate frosting. The book is organized by meal type, including Breakfast, Snacks & Starters, Salads, Soups, Side Dishes, Desserts, Drinks, and Homemade Extras, but the biggest chapter by far is Dinner! Because, when I personally read cookbooks, I’m usually looking for something inspiring to make for dinner, and I wanted to give you lots and lots of plant-forward main dish options. It’s a big fat 300-page book with a photo for every recipe, plus tons and tons of colorful infographics to inspire creative cooking. Recipes you’ll only find in this book – not on the blog! This is not a print compilation of recipes that are on the blog – they’re all new! I created them specifically for this book. “Every day” recipes that are actually exciting. We all know how to make green smoothies and avocado toast by now, so this book is filled with creative new recipes to expand your “every day” rotation. Recipes like Beet Muhammara Dip, Broccoli Rice Burritos, Zucchini Verde Vegan Enchiladas, Turmeric-Spiced Whole Roasted Cauliflower, and the best-everLemon Olive Oil Pistachio Cake are all part of my regular meal rotation now. Recipes for every season and some for any season. 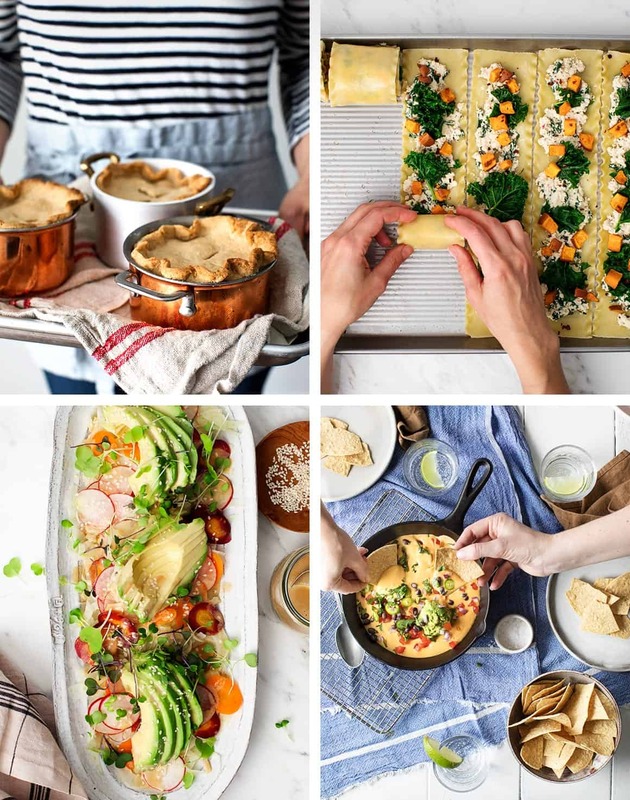 There are recipes to make right now while it’s cold (Cozy Mushroom White Bean Pot Pies, Sunshine Sweet Potato Curry), recipes that are ready for spring (Lemon Miso Spring Green Soup, Asparagus Snap Pea Pasta), and recipes that will have you (and me!) looking forward to your summer farmers market haul (the most amazing Heirloom Tomato Fattoush salad, Creamy Sweet Corn Pappardelle). And a few that can be made any time of the year, like the Peanut Butter Snickerdoodles that you will just want to make every day. The day you get your book, I suggest that you make the Flourless Almond Chocolate Chip Cookies (we constantly have a stash in our freezer), my all-time favorite Lemon Olive Oil Pistachio Cake, or these Vegan Date Brownies pictured above.